Mobile Communication Systems and Security arms readers with a thorough understanding of all major cellular air-interface technologies and their security layer techniques. 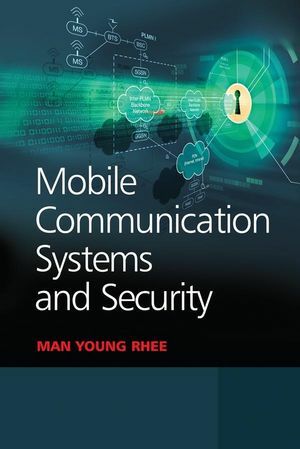 Rhee covers the technological development of wireless mobile communications in compliance with each iterative generation up to 3G systems and beyond, with an emphasis on wireless security aspects. By progressing in a systematic manner, presenting the theory and practice of wireless mobile technologies along with various security problems, readers will gain an intimate sense of how mobile systems operate and how to address complex security issues. The book is ideal for advanced undergraduate and postgraduate students enrolled in courses such as Wireless Networking, Wireless Security, or Mobile Radio Communications. Practicing engineers in industry and research scientists can use the book as a reference to get reacquainted with mobile radio fundamentals or to gain deeper understanding of the security layer. ManYoung Rhee is an Endowed Chair Professor atKyung Hee University and has over 45 years of research and teaching experience in the field of communication technologies, coding theory, cryptography, and information security. His career in academia includes professorships at Hanyang University (he also held the position of Vice President at this university), Virginia Tech, Seoul National University, and the University of Tokyo. Dr Rhee has held a number of high level positions in both government and corporate sectors: President of Samsung Semiconductor Communications; President of Korea Telecommunications Company; Chairman of the Korea Information Security Agency at the Ministry of Information and Communication; President of the Korea Institute of Information Security and Cryptology; and Vice President of the Agency for Defense Development at the Ministry of National Defense. He is a Member of the National Academy of Sciences, Senior Fellowat theKorea Academy of Science and Technology, and an Honorary Member of the National Academy of Engineering of Korea. His awards include the ‘‘Dongbaek’’ Order of National Service Merit and the "Mugunghwa" Order of National Service Merit, the highest grade honor for a scientist inKorea,NASPrize, the National Academy of Sciences, NAEK Grand Prize, the National Academy of Engineering of Korea, and Information Security Grand Prize, KIISC. He has also published the following four books: Coding, Cryptography, and Mobile Communications: Internet Security, John Wiley, 2003; CDMA Cellular Mobile Communications and Network Security, Prentice Hall, 1998; Cryptography and Secure Communications, McGraw-Hill, 1994; and Error Correcting Coding Theory, McGraw-Hill, 1989. Dr Rhee has a B.S. in Electrical Engineering from Seoul National University, and an M.S. in Electrical Engineering and a Ph.D. from the University of Colorado. 1 Global System for Mobile Communications. 1.3 GSM Transmission Network Architecture. 1.4 Signaling Channels on the Air Interface. 3 General Packet Radio Service (GPRS). 3.3 Layered Protocol Architecture of Transmission Plane. 4 Third-generation Partnership Projects (3GPP and 3GPP2). 4.2 Evolution of Mobile Radio Technologies. 4.3 Cryptographic Protocols Applicable to Wireless Security Technologies. 5 Universal Mobile Telecommunication System (UMTS). 5.2 FDD/TDD Modes for UTRA Operation. 5.6 UTRAN-CN Interface via Iu. 5.7 UMTS Security Related Features. 5.9 UTRAN Iub Interface Protocol Structure. 5.10 UTRAN Iur Interface Protocol Structure. 6 High Speed Downlink Packet Access (HSDPA). 6.1 Basic Structure of HS-DSCH. 6.2 Overview of HSDPA Enhancement Technologies. 6.3 HS-DSCH MAC Architecture—UE Side. 6.4 HS-DSCH MAC Architecture—UTRAN Side. 6.5 Overview of HSDPA Techniques to Support UTRA. 6.6 Orthogonal Frequency Division Multiplexing (OFDM). 6.7 Prospect of OFDM-based Applications. 7 CDMA2000 1x High Rate Packet Data System (1xEV-DO). 7.1 Architectural Reference Protocol Model. 7.2 Air Interface Layering Protocol. 8 CDMA2000 1x Evolution-Data and Voice (1xEV-DV). 8.1 UMTS (WCDMA) Versus CDMA2000—Physical Layer Harmonization. 8.4 CDMA2000 Entities and Service Interfaces. 9 Advanced Encryption Standard and Elliptic Curve Cryptosystems. 9.1 Advanced Encryption Standard (AES). 9.2 Elliptic Curve Cryptosystem (ECC). 9.3 Elliptic Curve Cryptosystem versus Public-Key Cryptosystems. 10 Hash Function, Message Authentication Code, and Data Expansion Function. 10.2 Secure Hash Algorithm (SHA-1). 10.3 Hashed Message Authentication Codes (HMAC).